It’s the 11th week of the year, which in numerology is 1+1=2 This week is all about finding balance, but where should we focus that search? The Page of Pentacles appears to give us some answers. 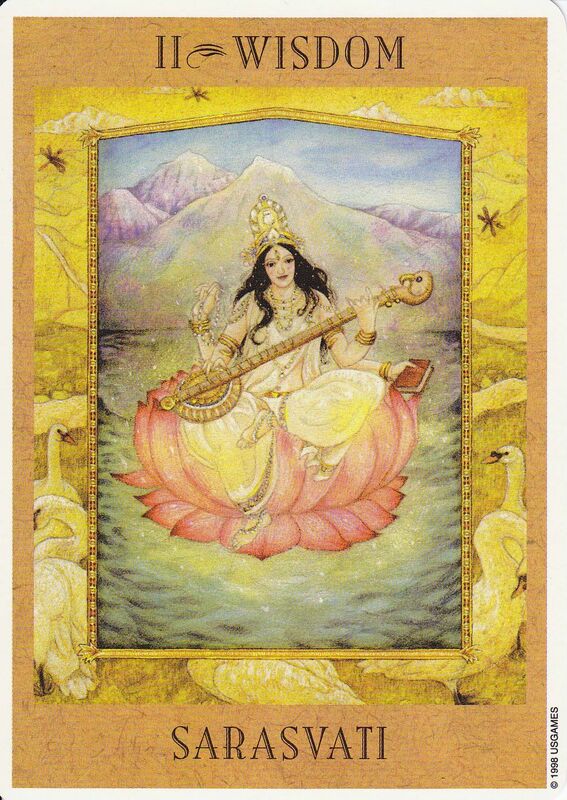 The Page reminds us that much abundance is being offered to us if we are open to learning. The Spring Equinox is just a week away and the Sun enters the first sign of the Zodiac, Aries, on Saturday. Spring is in the air bringing with it the ability to grow and change. 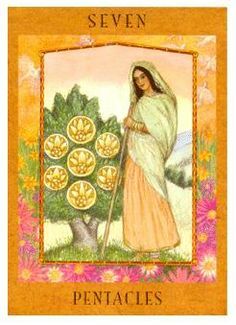 The Page of Pentacles is ready to plant the seeds of abundance. But remember, the Page is a novice so you are also being called to seek out new knowledge or education to further your goals. We also have a few transits this week that are going to be like wake up calls as to what you can do to influence and change the world around you. Listen to what comes to you during these transits because these are messages you need to hear. 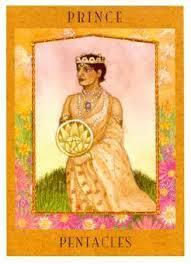 The Page of Pentacles is a card of realization of the abundance that surrounds you and all its glorious potential. Moon sextile Sun at 1:46 AM PST brings happiness, harmony and flow to your early morning. You’ll be feeling the bounty for sure and you’ll see new opportunities on the horizon. If you are asleep during this transit, this energy may express itself in your dreams. Moon square Venus at 5:21 PM PST brings the love of lushness to a lazy dazy evening. This transit also brings with it the potential for indulgence so make sure to keep yourself in check when it comes to spending and consumption. Moon opposition Mars at 6:42 PM PST is an irritable transit so keep your cool no matter how annoyed you may feel. The Moon is void of course until 2:03 PM PST when it enters Gemini, which could cause mood swings. The number of the day is 7, asking us to look within when we feel our lives are lacking. Mantra: Feelings come and go like the tides. 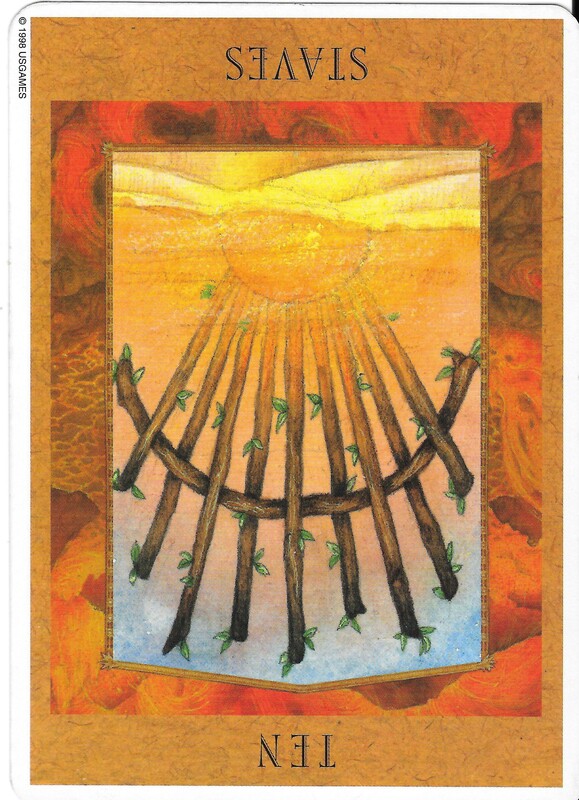 The Ten of Wands Reversed is a card that traditionally shows a figure carrying a heavy load. Reversed, the figure is ready to lighten the load as he or she realizes what tasks mean the most. This card can also represent avoidance when it’s reversed. Moon square Neptune at 7:07 AM PST brings fantasies and illusions that could lead to confusion. Mercury square Saturn at 12:26 PM PST brings delays and difficulty in communication. This could be a rather gloomy transit so try your best to keep on the sunny side. Venus square Mars at 1:48 PM PST brings turmoil to relationships. Sexual energy will be high so make good use of it to remedy romantic tensions. Moon opposition Saturn at 5:54 PM PST plays off the gloom and turmoil earlier in the day, making it easy to fall into a depression. Moon square Mercury at 6:44 PM PST will make it difficult to communicate the negative feelings you felt during the day and adds to the frustration. Moon square Jupiter will lighten the mood but beware of appearing egotistical. This is just your wounded ego trying to make a recovery. Moon sextile Uranus at 10:36 PM PST will bring a flash of inspiration that motivates you to put release the burden you’ve been carrying but be careful not to go to extremes. Mercury sextile Pluto at 11:57 PM PST will find you reflecting back on the life changing events and realizations of the day. You will now see how you can change the world around you. The Moon is in the dual driven sign of Gemini, reminding you that your perceptions of reality are objective. The number of the day is 8, a number of karma. Mantra: Life is what you make of it. When the 7 of Pentacles appears, it is a sign that your hard work is paying off but at what price? You may find yourself heading in the direction you wanted to go in but you’re having second thoughts. Mercury opposition Jupiter at 2:42 AM PST brings with it the energy to tell it like it is. Be ready to hear constructive criticism and learn from it. First quarter is at 10:03 AM PST. The intentions that you put in during New Moon are causing you to have some uncomfortable revelations as the past may come back to haunt you. It is your duty to rise to the occasion and overcome these challenges by Full Moon. The Moon is void of course until 5:57 PM PST when it enters the emotional sign of Cancer. If you are feeling challenged, approach obstacles with an open heart full of love. The number of the day is 9, a number that reminds us to that success is within reach. Mantra: Don’t stop, keep going. 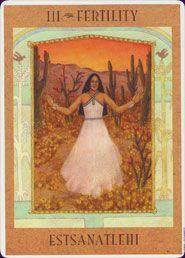 The High Priestess is a card that reminds us to listen to our intuition. If you are doubting yourself, turn within for the answers and trust that they will come to you. Moon trine Venus at 2:44 AM PST brings happiness, harmony and flow to whatever you’re doing. Intuitive messages will come to you with Mono trine Neptune at 12:10 PM PST. Jupiter trine Pluto at 1:26 PM PST will continue to reveal to you what your role is in changing the world. You will feel empowered and if you are called to be a leader, you will answer. You will feel that no matter what, success can be yours. You can right all wrongs in your by listen to your intuition. The Moon is in the loving sign of Cancer for the day which may inspire you to care for and nurture yourself and others. The number of the day is 1, a number of new beginnings. Mantra: I know that I am exactly where I need to be and I know exactly what I need to do. 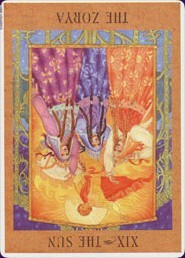 The Sun reversed is a card that appears when you need a reality check. There’s been a lot of good energy flowing this week but a bump in the road may cause you to temporarily lose your confidence. Or you may feel so pumped up on all the success you’ve experienced that you may be living in a egotistical fantasy. Moon sextile Jupiter at 1:00 AM PST is a confident transit. Moon opposition Pluto at 1:08 AM PST intensity that may rock your world. Riding on the back of this transit will be Moon square Uranus at 4:39 AM PST brings rebellious, liberating excitement. If you are asleep during any of these transits, these energies may appear in your dreams. Moon trine Mercury at 9:17 AM PST brings good communication and creativity to your morning. Moon trine Sun at 9:09 PM PST brings harmony to your evening. The Moon is void of course from 9:09 AM PST forward so it’s a good day to let things come to you. The number of the day is 2, a number of balance. 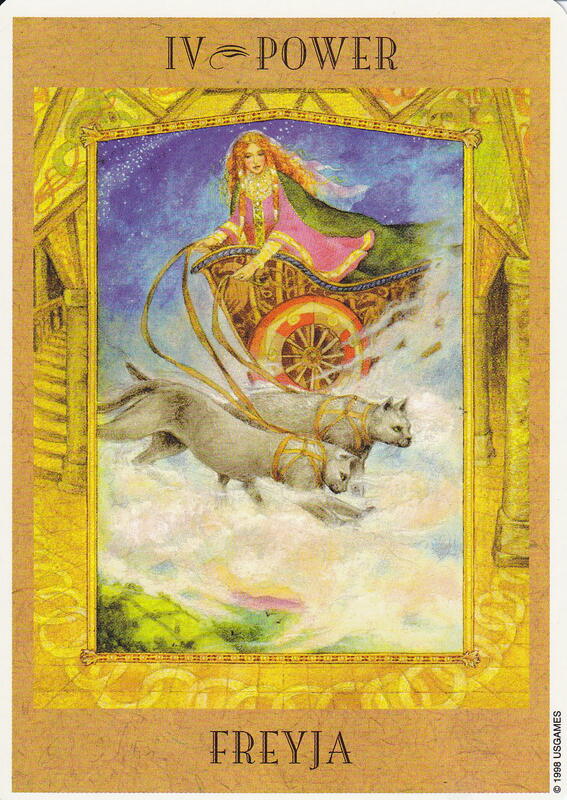 This card features Frejya, which is interesting because she is honored on Fridays. Traditionally, this card features a male because it has a lot of masculine energy. The Mars ruled Emperor is a card of strength that comes with established tradition and traditional authority. Moon trine Mars at 8:46 AM PST will bring leadership, confidence to your day. With the Moon in Leo, you’ll shine like the Sun and people will notice. The number of the day is 3, a number of achievement. Mantra: I’ve got the power and I’m in control. Whereas the card for yesterday was the stern Emperor, the card for today is his loving, fertile counterpart, the Venus ruled Empress. Together, these cards create a union between the traditionally masculine idea of strength and control and the traditionally feminine energy of nurturing. Moon trine Saturn at 8:08 AM PST will help you find that balance as you feeling very stable and comfortable. Moon trine Uranus at 1:43 PM PST encourages you to do something exciting and new. The Sun Enters the determined sign of Aries at 9:31 PM PST where he will stay until 4/19/16. While the Sun is in Aries, expect a surge of energy that will help you begin new projects. You may feel enthusiastic but you could also feel more stubborn than usual if things don’t go your way. Remember what the Empress teaches you about balancing hard and soft power. Moon is in Aries for the beginning of the day and then goes void of course so start tasks early and use the afternoon to wrap them up. The number of the day is 6, a number of harmony. Mantra: The right time is right now. The March Special is here! Click the image to book your reading today! Vintage occult with a flare: click on the box to go to the shop! New items coming soon! This entry was posted in Astrology, dreams, mysticism, numerology, occult, self help, spirituality, Tarot, Uncategorized, witchy, Writing and tagged astrology, Bidd Tarot, divination, intuative, metaphysical, mysticism, numerology, occult, pagan, psychic, spirituality, tarot, wicca, witchy. Bookmark the permalink.